OCTOBER STA. CRUZ FIESTA. When we learned that the 250-year old replica of Nuestra Señora del Pilar will be taken down from her niche to carry on the traditional procession that has been put on hold for several years, we went to Sta. Cruz Manila last Sunday to experience the religious parade. 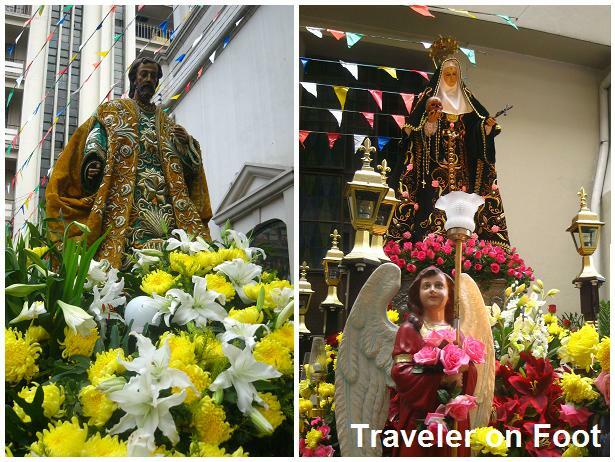 In the olden days, the feast of the Virgen del Pilar de Manila is one of the three great fiestas held in October. The long festive month began in Intramuros with a novena to the Santo Rosario. As the festivities drew to a close with the Procesion de la Naval de Manila, the novena of the Virgen del Pilar started in Sta. Cruz Church. And as this novena in turn ended, the wealthy creoles of the San Nicolas District and the nouveau riche Chinese of Binondo made the grand finale for the month’s fiesta with their gala procession of the Santo Rosario de Binondo. REVIVING THE TRADITION. All these happenings were suspended during the onset of the Second World War. But while the pageantry of La Naval procession has been revived at the new Sto. Domingo Church in Quezon City and the gala procession of the La Naval continued to gather the faithful in a solemn procession in the reconstructed and expanded Binondo Church a few decades after the war, the grand procession of the Nuestra Señora del Pilar de Manila has been revived this year. CARROZAS. From the moment we entered the church patio, it was obvious that it was festival day. The noise from vehicles passing busy Plaza Sta. Cruz was replaced by the flapping of colorful banderitas that canopied the entire church patio. Carrozas fashioned from wood and hammered silver carrying images of saints already decorated with flowers, lined the square while awaiting the main carroza inside the church. GLEEFUL PANDEMONIUM. Taken down from her niche at the side altar and standing ready on her carroza was the venerated image of Virgen del Pilar splendidly dressed in a shimmering silver. After the mass, a gleeful pandemonium began as devotees made encouraging shouts while waving white flags in honor of the Virgin. VIRGEN DEL PILAR. We asked a devotee who brought with him an old estampita framed in glass and decorated with rhinestones sewn on velvet curtain perhaps to recall those days when the proud women of Sta. Cruz marched with their patroness loaded with diamonds and studded with jewelry from head to foot. The old print, which we were told was bought in the 60s for one peso tells the story of the apparition of the Blessed Mother to St. James. According to the legend, while the apostle James the Greater was lamenting one night at the Elbro River for his perceived failure in evangelizing Zaragosa, the Blessed Mother appeared to him atop a column or pillar of jasper being carried by angels. St. James received consolation from Blessed Virgin and promised him that his mission would be fruitful as he had a church erected in her honor on the site. The Blessed Mother left the pillar of jasper on which the original image of the Virgen del Pilar stands today. A replica of the image was brought over by the Jesuits to the Philippines and became one of the most venerated images of the Blessed Mother in the country. THE PROCESSION. At 6 in the evening, the procession rolled out to Plaza Sta. Cruz then turned to Plaza Goiti. Each carroza was trailed by a marching band or throngs devotees reciting the rosary. The scene was like a vintage photograph of a grand procession taken in the 1920s with historic Sta. Cruz Church, the romantic Carriedo Fountain, and the old Monte de Piedad Building in the background. EPILOGUE. The procession path was cleared of venders and traffic upon reaching Carlos Palanca and Evangelista Streets. Upon turning to Recto Avenue, we proceeded to the nearby LRT Station. This time, we are above the crowd witnessing from a bird’s eye view a magnificent procession glittering with candle flames straight out from old Manila. I’m not from the Philippines. So what is this procession for? How often does this occur? Nice post ! I reallu\y appreciate your blog, you provide informative content about Manila ! I read some of your articles carefully and your content can be really useful for my readers looking for travel, tips and activities in Philippines ! Hi TOF, What a beautifully planned procession! So many colorful flowers.. I would have liked to witness it too. Your son seemed to be fascinated with the sweet estampita. It was a charming procession queeniebee. On regular days, taking photos of the image is not allowed. It was only during the procession we had a chance to take a picture of the Virgen del Pilar. I am fascinated by ephemera or vintage objects especially prints. The estampita with the image of Blessed Virgin is a collector’s item. I am too TOF, Look at how tenderly that owner had held onto and preserved that once inexpensive estampita. So lovingly adorned too–your son was quite taken with it, as I would have been!